We’ve officially entered December—the month that, if we’re not careful, will eat church communicators alive. But you, my friends, aren’t going to let that happen. Right? Right. Reflect on the amazing things that happened in your church over the past year and celebrate all that God has done. Think ahead to begin planning for a sustainable, healthy communications ministry in 2018. Laugh. It’s good for you. It’s good for the people around you. Plus, laughing burns calories, and, well, Christmas goodies have a lot of them. Webinar with some super-practical survival tips for 2018. Checklist to help you reflect, evaluate, and celebrate how Christmas went at your church. Specific ways to push pause—during the Christmas season and every day of the year. List of things you should consider quitting in 2018. 35 ideas you can use to show appreciation to your team and volunteers. Month-by-month plan to take your social accounts to the next level. Template you can use to create “A Year of Stories,” an annual report that goes beyond data. Suggestions for making the most of your Sabbath. Guide to planning a spiritual retreat. Devotional plan written especially to help church communicators get some rest and renewal. Plus 30 new social graphics and three super-fun posters that speak to the soul of a church communicator. 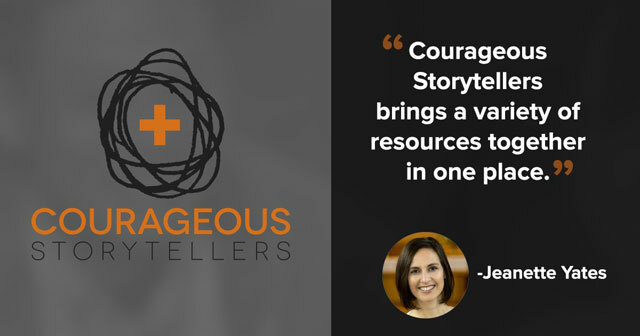 Every month, Courageous Storytellers offers fresh content to help church communicators stay afloat. Members get full access to the archives, so every month it gets better. Membership is just $29/month. (That’s less than $1 per social graphic, y’all.) Join today!